Latin American & Latino Studies Professor Gabriela Arredondo spoke on "LatinX Migrations: Histories and Current Questions." Situating the role research and researchers in the current climate was a resonant theme at the UC Santa Cruz Division of Social Sciences’ fifth annual Research Frontiers event, "Now is the time...Here is place." Campus and community members gathered at the Santa Cruz Museum of Art and History Thursday (Oct. 26) for a series of talks (links to listen) by six social sciences faculty on how their scholarship engages with critical issues of the day. 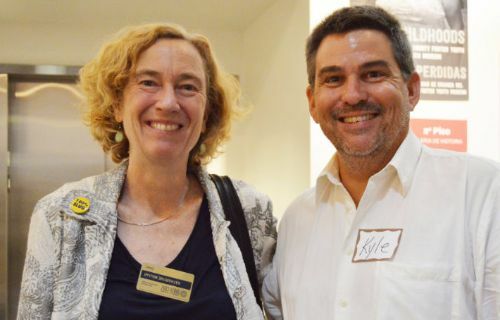 “The fact establishment does not seem to be helping us anymore,” said Dean of the Social Sciences Division Katharyne Mitchell who talked about ways scholars can actively engage their research with wider audiences. 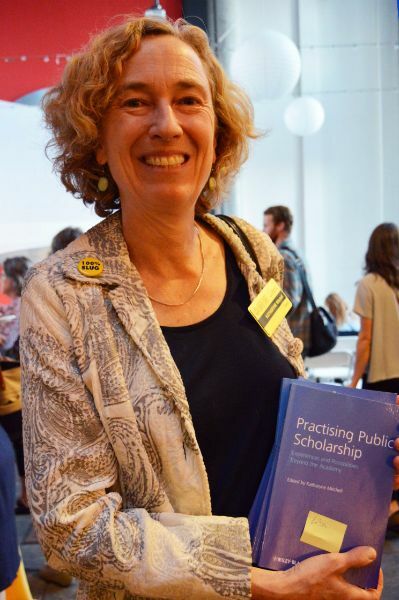 She offered public scholarship and participatory action research as examples of how scholars can work with their community in dynamic and transformation ways. “These are indeed challenging times but times of great opportunities as well,” said the dean in the keynote address. “Because interesting times tend to beget interesting ideas and interesting people who are determined not just to survive the times, but to use them to propel our species, other species, and the planet itself into a better future,” Mitchell added. One of those key issues raised was how researchers can respond to the assumptions and bias framing people’s understanding of the world. Latin American and Latino Studies professor Gabriela Arredondo talked about the persistent misrepresentation of Latin/x migrants. Psychologist Leila Takayama touched on people’s fear of robots taking over the world. Cultural anthropologist Lisa Rofel spoke about the anxieties felt in the Global South about the rise of China. “What is a fact?” demanded Arredondo in her talk about the historical discourse of Latin American migration into the United States. She demonstrated the persistent power of misrepresentations of Latinx peoples and the dangerous consequences those entail. Examples included the pervasive portrayal of Latina migrants as “hyper-fertile” threats to the nation who are procreating themselves into majority status. She also presented evidence to debunk these popular myths including declining birth rates that are nearly like those of other groups in the U.S.
“The persistence and power of these kinds of discourses have created what scholars call regimes of truth,” Arredondo explained. With these regimes come real consequences: extremist policies fueled by alarmism and not facts, tragic increases in migrant border deaths, and polarization of views. “How do we as scholar activists respond?” she asked. In answer Arredondo discussed her current research project and its urgency: focusing on the pivotal interventions led by “ethno-racial cooperation” including civil rights organizing and social justice advocacy, Arredondo’s research seeks to offer one way we can overcome the divisive polarization of our current political moment. Continuing the discussion about the assumptions framing everyday experiences was Takayama who spoke about the role between people and robotic interaction. “It’s all about the people behind the machines,” said Takayama in her presentation. She urged people to understand that a team of designers, builders, coders, artists, and psychologists like herself help create robots. Robots do not exist in isolation, and they already exist in people’s daily life: from the ATM at banks to the GPS in cars, robotics are here. It is about adjusting perception. “It’s not about robots, it’s about us,” Takayama added about people’s fear of robots taking over. In actuality, robots are already here. Similarly, as cultural anthropologist Rofel argued in her talk about China’s international presence, is also important to look at the cultural and historical framework that frames their understanding of the world around them. 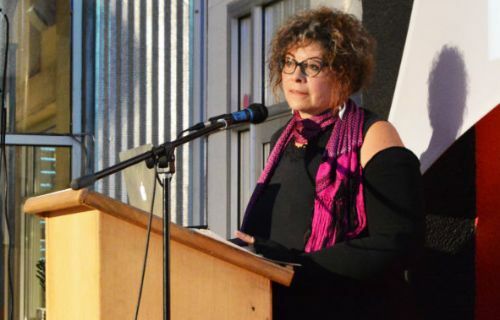 “Some people think that with all the problems we are having locally these days, that we should not be thinking about other places in the world,” Rofel said. She aalso said that what China is doing in the world will have a very strong impact on our local lives and it is always important to connect the international with the regional. Other talks at Research Frontiers Evening looked at climate change, ecological restoration, and affordable housing. The theme for this year’s "Research Frontiers Evening" was “Now is the time... Here is the place.” Research Frontiers Evening is an annual interdisciplinary event held by the UC Santa Cruz Division of Social Sciences to bring together faculty, students, and community members to present and learn about how social sciences research is engaging key issues of the 21st century.